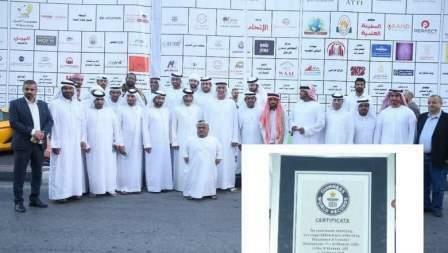 The 'biggest advertising board in the world' is the latest addition to the Guinness world record for Ras Al Khaimah. Up to 1,563 companies have participated in the making of the 1,000 sqm billboard, according to Dr Abdulrahman Al Shayeb Al Naqbi, director-general of the RAK economic development department. "The biggest ad board in the world is part of a series of initiatives of the department that are aimed to promote business and commercial activities, and boost partnership with the private sector." The inauguration ceremony saw the presence of Sheikh Mohammed bin Kayed Al Qasimi, chairman of the department, along with senior officials and representatives of the Guinness World record. "The board has been developed in collaboration with Skyhigh Company, and directors of companies and shops in the emirate. All participant companies had a chance to display their products and services," said Dr Naqbi. Recently, the emirate had received the Guinness world record for the longest zipline in the world, extended over the Jebel Jais, the highest peak in the country. Dr Ahmed Salem, a businessman, said that Ras Al Khaimah is coming up with innovative schemes and initiatives that do boost its position in the global spectrum. "The RAK government spares no effort to turn into a leading business hub around the globe."